BMW might be a little bit late to offer a compact MPV in its ever-growing line up, but this is a niche that the firm cannot ignore. The 2 Series Active Tourer borrows its underpinnings from the MINI brand, which means this family-orientated machine is the first BMW-badged car to be front-wheel drive. That is tantamount to sacrilegious behaviour among BMW fans, but buyers of the 2 Series Active Tourer won’t, and shouldn’t care. That front-wheel drive layout makes sense here. 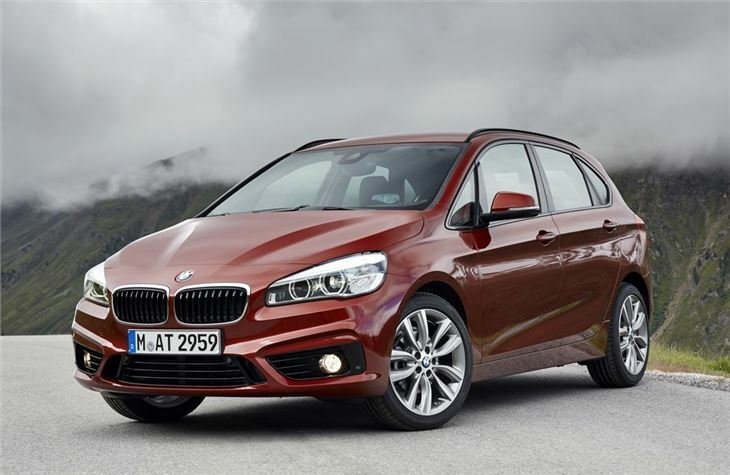 The Active Tourer’s goal is simply to provide a usefully shaped, versatile and spacious car. Driving its front wheels allows it to do that. 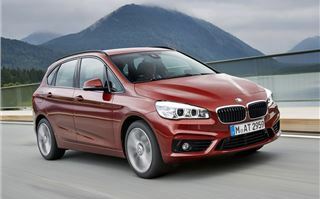 It is no surprise then that all its rivals are similarly driven, though the BMW is one of only two compact MPVs out there wearing a premium badge, its closest direct upmarket rival being the Mercedes-Benz B-Class. That BMW badge does mean it starts at a price point at the upper end of its mainstream rivals, at least the launch 218d SE with its 150PS 2.0-litre turbodiesel engine does. The range will be expanded in time to include a cheaper 216d, its CO2 figure almost certain to be under the 100g/km barrier. At the upper end of the diesel range a 220d model will be offered, optionally with four-wheel drive, while the petrol line up will consist of 218i, 220i and 225i models, the later only offered with all wheels driven. The entry-level 218i is powered by the same three-cylinder 1.5-litre turbocharged petrol engine as its MINI relation, but it’s the 216d and 218d models that will make up the bulk of BMW’s UK sales. Rightfully so, the 218d’s 150PS, 2.0-litre engine being the latest generation unit from BMW, its smoothness being exemplary, meaning there’s no vibration and barely any noise entering the beautifully finished interior. The engine’s refinement is backed with excellent performance, the 2.0-litre unit’s 330Nm of torque makes it an easy drive, only the sometimes obstructive shift from the standard six-speed manual ruining that. There’s an optional eight-speed automatic, which adds £1550 to the list price, but doesn't impact negatively on the manual car’s combined consumption and CO2 figures of 68.9mpg and 109g/km. The automatic doesn’t change the official 0-62mph time either, remaining at 8.9 seconds. That front-wheel drive format might upset the BMW diehards, but customers won’t notice. There’s no corruption of the steering, which offers decent weighting and good response, the BMW Active Tourer being among the sharpest driving compact MPVs out there. The suspension copes with rougher surfaces, even on larger alloy wheel set ups, though its ability to smother poor tarmac will diminish if you opt for the M Sport trim, which comes with a more sporting suspension bias. With its family-orientated nature the Active Tourer’s softer set-up is appealing. There is some roll in the bends as a result, but not to the extent of its competition. The Active Tourer may not be sporting but neither is it so yawn-inducing to drive as its key rivals. It eclipses its Mercedes-Benz alternative and while Volkswagen’s Golf SV is equally good to drive that BMW badge carries far more weight for buyers. So too will its interior. The BMW’s dashboard feeling very upmarket in the family compact MPV class. It’s impeccably built, the multi-layered, many-surfaced dash not only pleasing to look at but easy to operate and a tactile delight. Even SE models come with an iDrive dial, which controls the main info and entertainment functions. Its operation is easy enough that the anticipated 70 per cent of customers who’ll be new to the brand won’t have to spend too long familiarising themselves with it. No bad thing with a back row of seats full of distracting children. Those rear seats are perhaps a touch disappointing for those looking for outright family versatility. The Active Tourer’s rear pews feature a pair of properly proportioned outer seats, the middle one best thought of as an occasional seat for your smallest of passengers. Still, the two outer passengers will be comfortable, with leg and headroom being generous. The 40/20/40 split on the rear seats offers some versatility, sliding in a 60/40 format, the seat backs folding electronically to create an almost flat boot floor. Access to the boot via the standard automatic opening tailgate is good thanks to no lip into the load area. There’s an underfloor compartment too, into which you can bung all sorts of family detritus, but useful as the Active Tourer is it lacks the outright seat variability and versatility of its mainstream rivals. It’s unlikely you’ll miss that though. What you might is cubby space, which is neither as plentiful or capacious as something like Citroen’s C4 Picasso. Still, all the less areas to fill up with slowly rotting fruit, half-eaten biscuits and raisins that otherwise in time would litter the Active Tourer’s interior. It ticks the many boxes for its intended audience, that being tired, busy parents wanting something with a premium badge and decent running costs. That it’s not so crushingly dull to drive as the majority of its rivals is a bonus, rather than a necessity. Indeed, the Active Tourer underlines that driver fun isn’t mutually exclusive with fertility, it's enjoyable enough to take some of the chore out of daily family taxi duties. Running costs will be low thanks both to its decent economy and high anticipated retained value - negating its higher purchase price. Specification is good with even entry-level SE models featuring the automatically opening tailgate and dual-zone automatic air conditioning. It might not be as thrusting as your typical BMW, but then it’s got a lot of other, more appealing, qualities for family buyers. Expect to see a lot of them around soon, not about an inch off your bumper, but parked outside schools and nurseries.